As part of our commitment to provide a delightful customer experience, we continue to work on improving our products and services. Thus, we would like to inform you that we will be discontinuing the BPI ePay Virtual Card, effective December 5, 2017. You may request for fund transfer to your existing BPI Deposit Account by visiting any BPI Branch or calling 89-100. Press 1 for BPI Express Teller. Enter your 11-digit access number. Enter your 4-digit Telephone ID number (TIN). Press 3 for Bills Payment. Press 2 to Enroll Bills. Log-in to your BPI Express Online account. Joint Account Indicator (JAI) No. – this is a 2-digit number located at the lower right corner of your ATM card, right across your name. 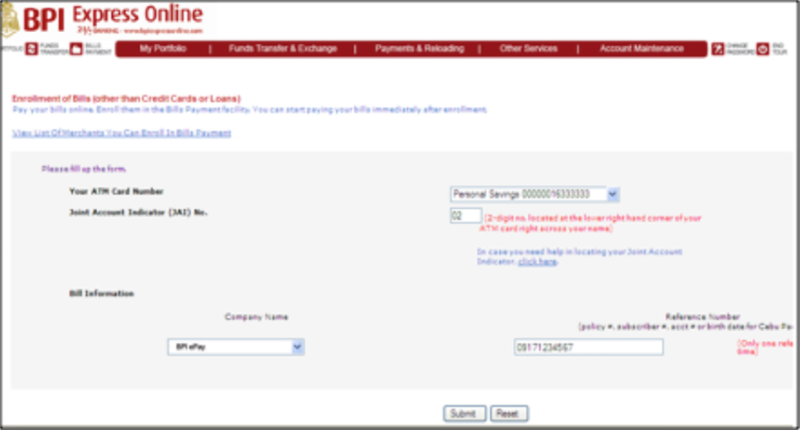 Company Name – Select BPI ePay from the drop-down tab. Reference Number – Input the mobile number that your provided when you created your BPI ePay Account. Click Submit. You can now add funds to your ePay Account via BPI Express Online. 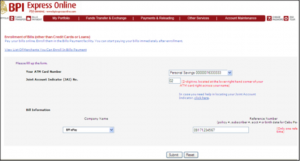 Login using your BPI Express Online User ID and Password. Select Pay Bills from Deposit Account. Select your Deposit Account you wish to use as From Account. Select BPI ePay Loading as the Merchant. Enter the Amount you wish to add to your ePay Account and click Submit. The amount you added will be reflected to your BPI ePay Account balance after 2 banking days. Press 1 to Pay Bills. Press the number indicating BPI ePay Loading (A voice prompt will mention all bills payment merchants enrolled to your account). Enter the amount you wish to add your ePay Account. Please note that the last 2 digits connote centavos. The amount you added will be reflected in your BPI ePay Account balance after 2 banking days. Select your account type (Savings or Current). Enter your 4-digit ATM card PIN. Enter the amount your wish to add to your BPI ePay Account. Enter the number key corresponding to BPI ePay Loading as show on the ATM screen. Press Continue when asked to enter validation data. Review the details shown on the screen, and press Correct if information is correct. Log in at BPI Express Online. Go to Payments & Reloading > Bills Payment > Pay Bills TodayPay. Amount: Enter amount of money you want to add to your ePay Account.Note: You are required to pay a P20 fee* to add funds to your ePay account. This fee will be deducted from the amount you add. If you want to add P500 to your funds, the amount you need to add is P520. *The P20 fee for Adding Funds is FREE until August 31, 2016. From Account : Select account number of the deposit account you want as source of the added funds.